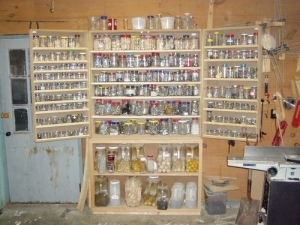 Homemade shop hardware cabinet intended to house glass and plastic storage jars. Attached to the wall for stability, the door of the cabinet is fashioned from pegboard to enable the ready hanging of small tools. If I have to look at every jar every time...not the solution for me. However, this is a great build!